When I moved back to the area in 2006, I discovered, much to my pleasure, that Rachel was still in the area. And not only that, but that she was playing in an Irish band (My Darling Asleep) and the band, The Commonwealth, at the time. Not long after that she, Nico, and Austin formed Bourbon Baroque. I still have some emails from ’06 inviting me to The Commonwealth and My Darling Asleep shows but at the time I was still heavily gigging with my Indianapolis based group, il Troubadore, (we’d played well over 200 shows in ’06) so I was almost never in town. By 2007 I’d finally get a chance to see Rachel play with My Darling Alseep. Here’re some vids I took of a show at Brendan’s from November of that year. When we’d get together we’d chat about old times, old music friends, and how our respective careers went south of Classical. In April of ’08 I got an email about Bourbon Baroque and by May of that year an invite to the Abbey Road on the River shows which she was heavily involved with–I remember that Abbey Road LIVE!, who were playing the festival, was doing their Magical Mystery Tour that year as I remember telling her that I was playing with them in Nashville, Tennessee later that month with my brother Joe. Of course, I couldn’t make AROTR that year either since by that time I was touring around the US with the multi-Grammy Award winning country star, Ray Price and juggling my schedule with il Troubadore. By the end of the year I would also be playing with the Louisville based Arabic Band, Ahel El Nagam. 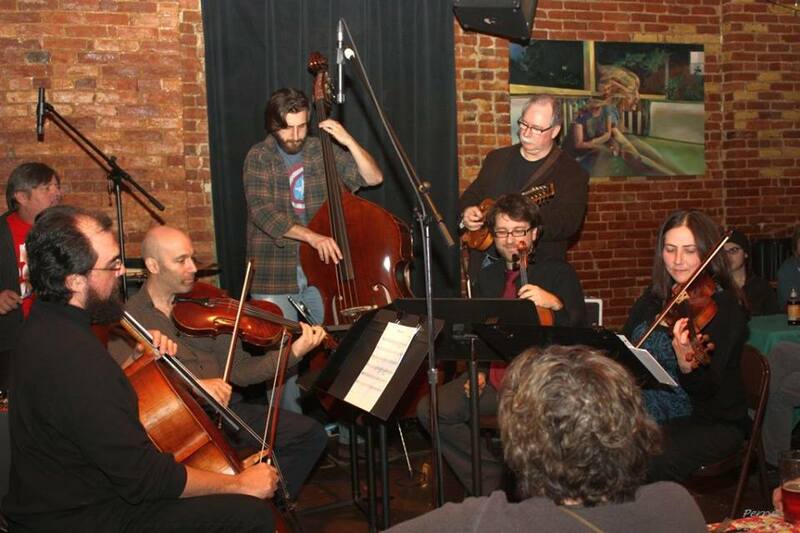 Bourbon Baroque Messiah afterparty (Nov 2013). We did a Messiah singalong after our performances of the Messiah that weekend. Again, when we’d meet we’d chat about all these things and having to juggle multiple bands and working in non-classical formats and venues. It was about that time that I started to teach/coach again and started playing Classical gigs again. By late 2011, I’d finally get to work relatively regularly with Rachel in Bourbon Baroque and Weddings and Private Party gigs. Wee even recorded together for her partner John D’Amato’s CD. Rachel Blanton, Michael Hill, Charlie Blanton, Jon Silpayamanant cutting tracks for John D’Amato’s CD. By the time we’d get to gig together with any regularity I imagine we’d both gone through more than a dozen groups between the two of us–hell, I was still regularly playing with a dozen active groups at the time. I was actually thinking about Rachel on Christmas Eve while on the way to a gig. 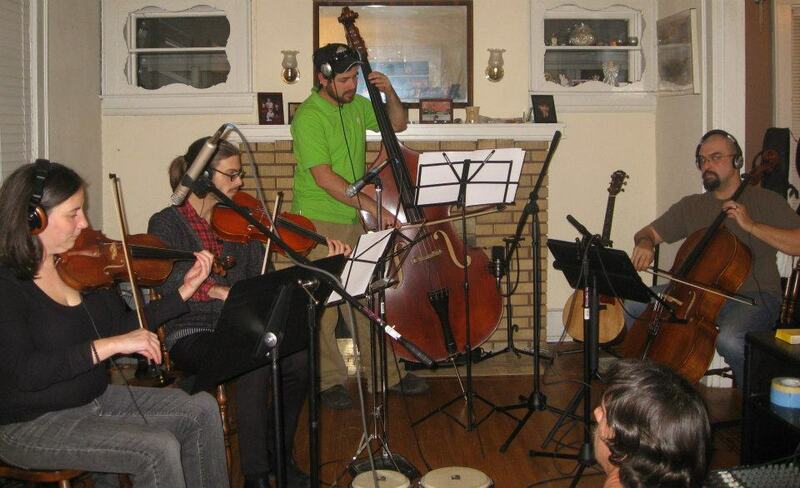 I’d remembered a private gig we did at a private residence in Harrod’s Creek (out in the middle of nowhere) last Christmas season. I was there very early since I left myself plenty of time to navigate the not-so-clear directions. A few minutes before the gig Rachel texts that she’s lost (I still have the whole text exchange) and that her phone was almost dead. After some time we sort out a good meeting place for me to lead her in so I drive out there and wait. Several phone calls and texts later she finally finds me and we drive back to the home. The hosts were very understanding and we had much bourbon eggnog to warm up to and once Rachel settled down we were just down to business as usual. After the Christmas Eve service, I didn’t think much of that experience again until I heard the next day that Rachel had passed. Playing the JD Michael’s Band CD release show with Rachel in February 2013. The second thing I said was I’d remember how kind and giving a person she was and how enthusiastic she always was about playing music of any kind. 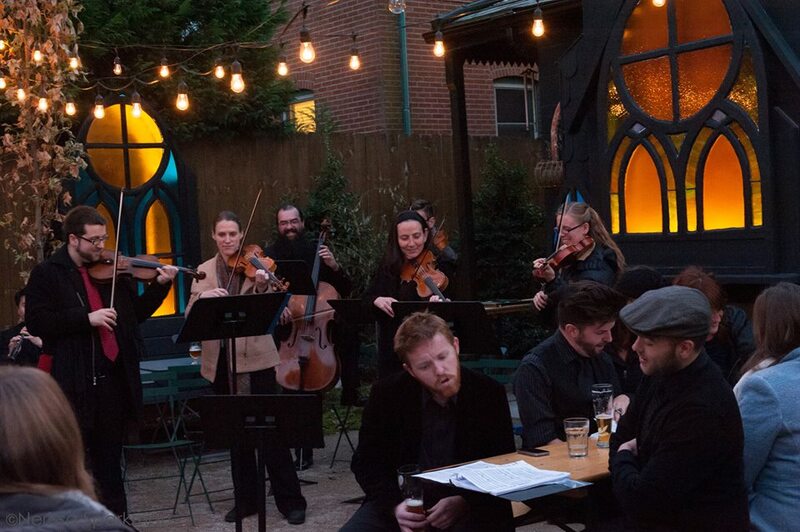 But the first thing that came to mind wasn’t all the weird and exciting and non-classical music we’d spent so much time talking about, nor eventually the time we did finally end up gigging together more regularly with Bourbon Baroque, Weddings, Private Parties. It was the time we spent just talking about my brother, Joe, who passed away in 2010. Just sharing stories of someone close to us is an important thing to have and can help with the healing. I hope my poor prose is a good enough substitute for shared personal stories. But I think it’s appropirate that I finish out my blog for the year with stories about someone close to me and the local music scene rather than the big grand analyses of the international Classical Music scene. What a beautiful tribute, Jon. I met Rachel when she was a high school senior. I taught at New Albany High School one day a week in an economics class sharing my business knowledge with the students by teaching them how to read the Wall Street Journal, invest in stocks and the time value of money. Rachel was in this class and I was so impressed with what a lovely and caring young woman that she was. Losing Rachel is a terrible loss for our community. Rest in Peace, Beautiful Soul.